When planning a document scanning service, you’ll need to calculate the amount of documents you have to scan in order to get a picture of the size and costs of your project. 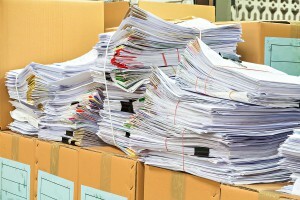 The most common methods used to estimate your papers is by the number of banker’s boxes or file boxes you have, or how many sheets of paper per inch you have in a filing cabinet or shelf. We’ll usually start by asking you how many boxes you have to store or scan, but here’s some more specific information on how you can get to that number to receive an accurate quote. How Much Paper Can Fit In a Standard Banker’s Box or Copy Box? Depending on the type of paper and the amount of file folders that you have in each box, you can fit approximately 2000 to 2500 sheets of paper in a standard bankers box. How Much Paper Can Fit In a Large File Box? 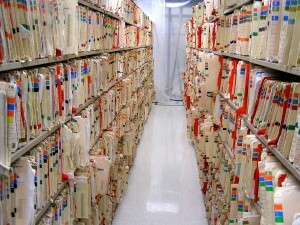 The number of documents per inch on a shelf or in a filing cabinet depends on how tightly the papers are packed together. On average, you can figure that you’ll have around 150 to 200 sheets per inch of space on your shelf or cabinet. If your documents aren’t packed tightly and you have 150 sheets per inch, then you need (1) standard banker’s box for every 13” to 16” of space on your shelves. If you can’t fit one more piece of paper on your shelf, you’re probably closer to 200 sheets per inch. In that case, you’ll need (1) standard banker’s box for every 10” to 12” of space on your shelves. Although this is an approximate number, it will give you an idea of how many boxes you have, or approximately how many actual documents that you might need to scan. Scanning and organizing boxes full of documents takes time. Record Nations has professionals who have been in the industry for years and have the proper equipment to make your scanning job quick and easy. To get a free, no obligation quote today or if you have any questions on calculating your scanning project, give us a call at (866) 385-3706 or just fill out the form on the right. We’ll have quotes from local scanning professionals to you within minutes!